Groundwater Sciences Corporation (GSC) was retained by a regional petroleum firm to close, characterize and remediate a former retail and bulk petroleum storage facility. Unleaded gasoline and diesel fuel had leaked from underground storage tank (UST) systems located in separate areas of the site. The site also had historical bulk above-ground storage tanks and an unleaded gasoline UST system that had been removed, but had not been through the Chapter 245 closure process. Source removal in the form of a soil excavation Interim Remedial Action (IRA) was conducted during separate unleaded and diesel UST removal activities as a means of remediating impacted soil and to assist in remediation of groundwater by removing what would be an ongoing source of groundwater contamination at the site. 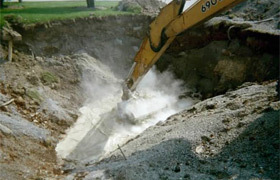 The IRA included the removal of impacted soil, groundwater and product sheen in the UST areas and dispenser areas. Routine soil attainment sampling was conducted and soil attainment of the Statewide Health Standard was demonstrated for the closed USTs. GSC negotiated a separate attainment plan for the historically closed systems and soil attainment was demonstrated. The site was granted Relief from Liability using the Statewide Health Standard for soil. 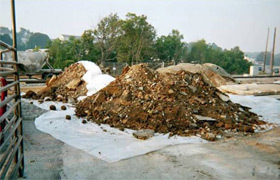 The site building had a large enclosed crawl space and an innovative plan for sampling soil vapor in the crawl space was negotiated with the Pennsylvania Department of Environmental Protection (PaDEP) to demonstrate that there was no unacceptable risk from soil vapor despite soil vapor concentrations above the Act 2 medium-specific concentrations (MSCs). An unleaded gasoline plume with benzene and MTBE concentrations above the Statewide Health Standard remained in the vicinity of the former UST systems and extended off-site. GSC performed fate and transport analysis and Relief from Liability was granted by PaDEP using the Site-Specific Standard for benzene and MTBE in groundwater based on the absence of a complete exposure pathway. The site was closed without post-remedial care for a fraction of the cost of similar sites of this size and complexity.